Here we see the eastern curtains of the old and once Confederate-held masonry fortification, Fort Morgan near Gulf Shores, Alabama, shown after damage to from U.S. Major-General Granger’s heavy artillery brigade composed of the 21st Indiana and 6th Michigan Heavy Artillery in 1864 during the Battle of Mobile Bay. Compared is a shot by Dylan Tucker, Site Historian at Fort Morgan, of the present day wall. Equipped with four 10-inch mortars and four 8-inch howitzers, the 6th Michigan (formerly an infantry unit) was rushed all over the south and had a specialty in reducing masonry forts. They pounded Forts St. Phillip and Jackson downriver from New Orleans in 1862 and served at the Siege of Port Hudson. During the Civil War, the 2-million man Union Army needed modern firearms and they needed them yesterday. Besides buying up German, British and French designs in Europe, they let it be known that they would take (just about) anything from domestic producers that had rifling . Thats when Baltimore gunsmith James Merrill came about with a design for a handy little .54-caliber breechloader (this in itself made it pretty sweet as almost everything else was a front-stuffer) that used a nice tilting-block action. Although he had designed the gun before the war, nobody wanted it. However in 1863 he hit pay-dirt and managed to get some 14,500 of various models produced and sold before the end of the war. In all about a dozen bluecoat regiments marched or rode off to war with Mr. Merrill’s little gun. They are exceptionally rare today. 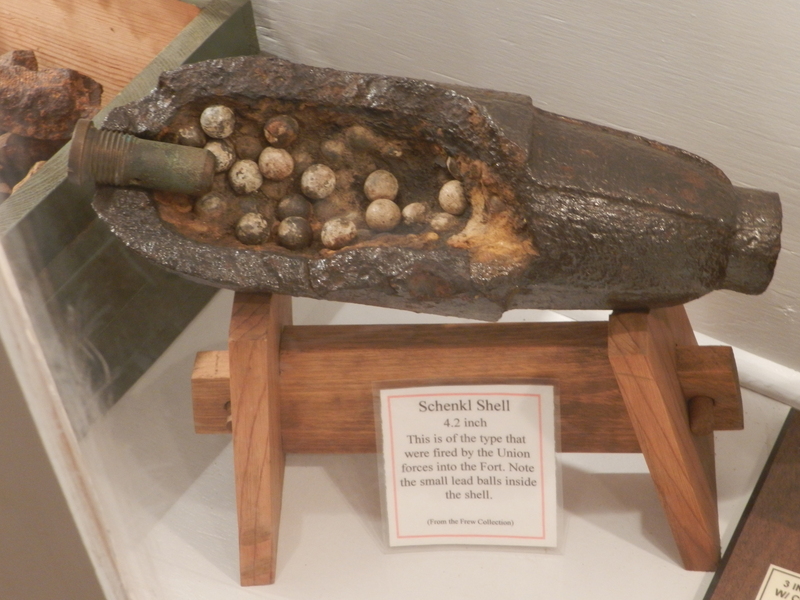 Here we see a 4.2-inch U.S. Army Schenkl shell from the Civil War period. 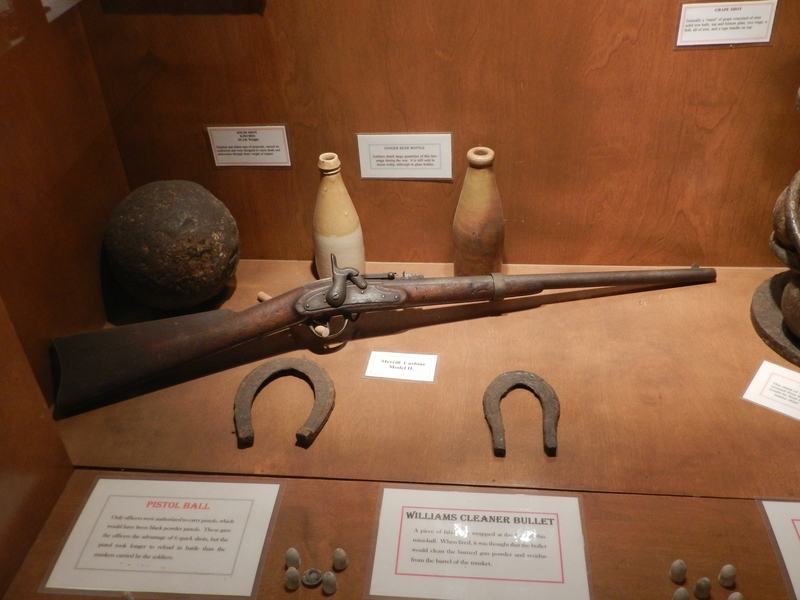 This specific one was fired into the grounds of Confederate held Fort Morgan on the Gulf Shores Peninsula at the Eastern shore of Mobile Bay in 1864 while that installation, one of the last rebel forts, was under joint Army-Navy siege. Note the fuze and internal shrapnel balls. The Schenkl is one of the most easily recognized Civil War era projectiles due to its unique shape. A cylindrical PapierMaché sabot was wrapped around the tapered cone base. When fired the sabot was forced forward and was expanded into the rifling by the cone. There are vertical raised ribs on the tapered cone to insure rotary motion was imparted to the projectile. The paper sabot disintegrated as the shell left the muzzle which made this type safer than metal sabot types when firing over the heads of friendly troops, as there was no danger of injuries from separated sabot fragments. On the negative side, the PapierMaché was very sensitive to moisture. Too damp and the sabot would swell, interfering with loading. Too dry and the paper would crumble before it performed its function, often causing the shell to tumble as it left the gun. Here at LSOZI, we are going to take off every Wednesday for a look at the old steam/diesel navies of the 1859-1946 time period and will profile a different ship each week. These ships have a life, a tale all of their own, which sometimes takes them to the strangest places. 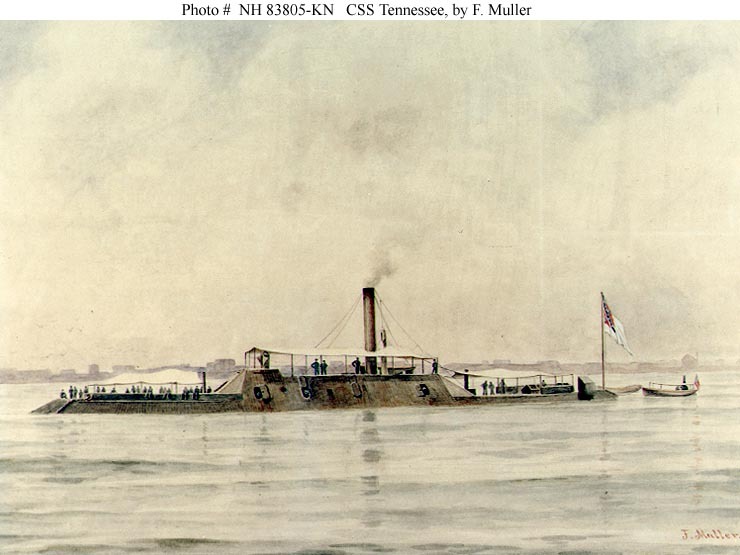 Here we see the great steam-powered casemate ironclad warship, CSS Tennessee, pride of the Confederate Navy sailing out to meet the Union fleet. Never fully operational, she met her fate and proved her metal 150 years ago this week at the Battle of Mobile Bay. 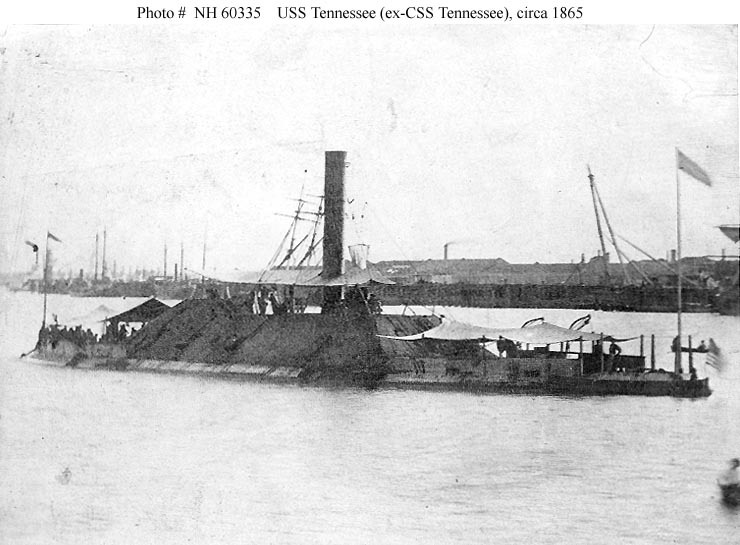 Designed by John L. Dixon, she was the largest Confederate ironclad completed during the war. Her 209-foot long hull constructed at the heart of the Confederate steel industry in Selma, Alabama, in 1862, she was shipped incomplete down the Mobile River system to Mobile herself for completion. One of the last southern ports, Mobile was vital to the South’s continued resistance in the last stages of the war. There, in the shallow mud flats, she was neared to completion under the direction of Joseph Pierce, Acting Naval Constructor in the area. She was fitted with some 5-6 inches of heavy steel armor plate, three sheets thick, made in Shelby, Alabama. She was equipped with a pair of hard-hitting 7-inch double banded Brooke guns and another four, slightly smaller, 6.4-inch guns, making her perhaps one of the most formidable vessels afloat in the hemisphere if not the world at the time. The problem was she had a slow and inefficient steam plant salvaged from the old steamer Alonzo Child. With this plant operating at maximum capacity, it could push the 1200-ton battleship to just 5-knots if lucky. This made her ram bow almost a joke of a weapon as most ships could evade the slowly moving but heavily armored ironclad. Watercolor by F. Muller, circa 1900. 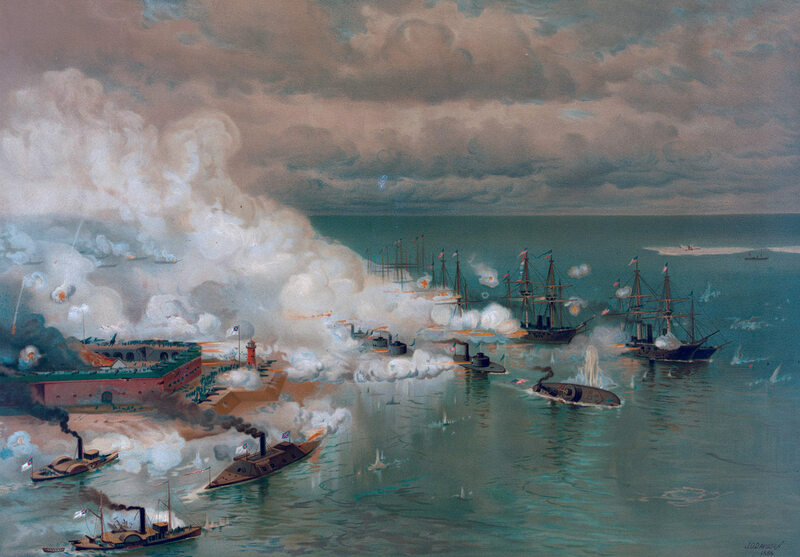 Courtesy of the U.S. Navy Art Collection, Washington, D.C.
Made the flagship of Confederate Admiral Buchanan, who had helmed the earlier CSS Manassass to her fitful clash with the USS Monitor just two years before, the nearly finished met the might of the Union Navy at the mouth of Mobile Bay on August 5, 1864. There, U.S. Rear Admiral David G. Farragut was leading an armada of eighteen ships, including four new monitors, past the two forts barring the entrance to the last sovereign Confederate watershed. All Buchanan had at his disposal was the Tennessee and three sad little wooden gunboats armed with popguns. This placed the ironclad at the heart of the southern fleet’s answer to the invaders. 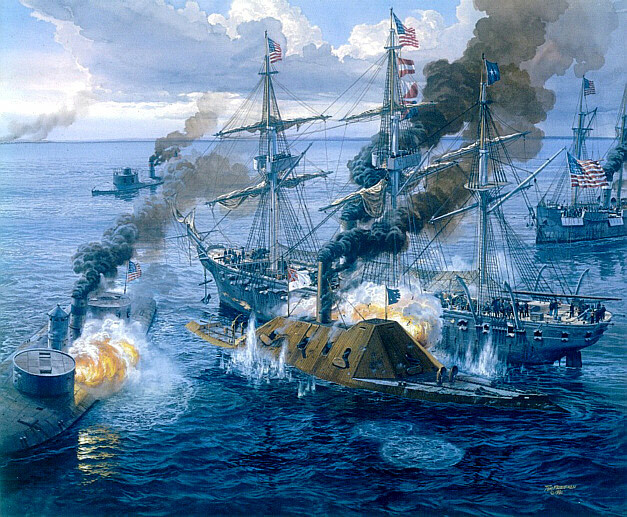 Steaming into the fray, the ship closed with Farragut’s classic naval frigates Hartford and Brooklyn and exchanged cannon fire with these wooden ships at point-blank distance. This continued until the new USS Chickasaw, a Milwaukee-class river monitor, closed with the larger beast and raked her with fire, keeping her at bay. Over the course of the next several moments the fleet pounded Tennessee, taking away her steering chains and holing her in several places. With no other alternative, and fighting a losing battle with a predetermined outcome, Tennessee surrendered. Within days the Yankees had repaired the ship and placed it under the star-spangled banner as the USS Tennessee, using her, in the ultimate irony, against the Confederates at Fort Morgan. Following victory there she was sent to New Orleans for more extensive repairs and kept in service with the U.S. Navy’s Mississippi Squadron. In 1867 the ship was scrapped. Port quarter view, probably taken off New Orleans, Louisiana, circa 1865. She was formerly CSS Tennessee (1864-1864).U.S. Naval Historical Center Photograph. Her guns are on display around the country including several of her Brookes at the Washington Navy Yard, Washington, D.C, another at Norfolk, and one at Selma, where it was cast. If you are free and around Mobile this weekend, there is the 150th Anniversary of the Battle of Mobile Bay. Centered around Fort Morgan, they will have a mock-up of the Tennessee. You should check it out if in the area.